Last week, I considered the extent to which board and card games ought to be accurate with respect to matters of fact – how much they can, and should, cohere with the world they represent in terms of historical and geographical accuracy. What about a game’s representation of processes? How likely are these to misinform, and how likely are players to be alert to the fact that a game could be deceptive in this sense? To put it another way, what ought we to make of an economic game founded on mechanisms not found in reality? Anyway, German Railways is rather particular in how it handles dividends: paid out by all companies in the game when the networks of any two companies first meet, each share yields a dividend equivalent to the current total income of the company in question, no matter how many shares in the company have been sold. So, for instance, the Berlin-Hamburger railway may at the time of a dividend payment have an income of 12 talers: if one share in the company has been sold, then the company will pay out 12 talers to its one shareholder. If, however, two or three of its shares have been sold, then 24 or 36 talers will be paid out – 12 per share. In contrast to most other games, a limited dividend pool is not diluted as more shares are sold. Naturally, this has a dramatic effect on the entire economy of the game, and greatly impacts upon the kind of investment strategies which will be successful. It also appears to estrange the game from the real world. Were there not limits on the number of shares to be sold in each company (only three are available for each), and were there not a game end condition which tends to arrive swiftly (play concludes when all companies have a network which directly connects to that of two other companies, or when it becomes impossible for this to occur), then limitless money could be paid out. Indeed, even in a particularly attritional game, all players will tend to be much richer by the end of the game than they were at the start (or at least, that is my experience to date). Of course, it can hardly be imagined that a player would approach a game with only three possible actions as an accurate reflection of real world economics: but is it better to say that a game like German Railways is valued in spite of its inaccuracies, or because of them? What is the relationship between the game’s limitations as a simulation and its value as an exercise? 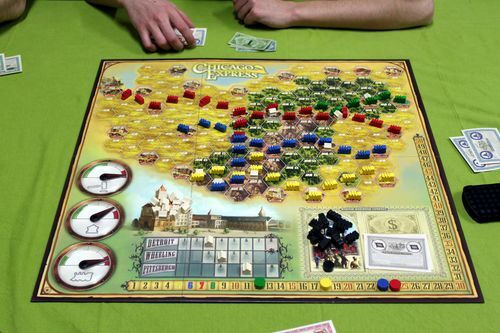 Part of what makes German Railways an interesting case to consider is that it has a (better-named) sister game, Chicago Express (first released by Winsome Games as Wabash Cannonball), which is built on largely the same fundamentals. However, Chicago Express can be said to be closer to reality in that in it additional shares do dilute a finite dividend pool. If a company in the game has an income of ten dollars, and one shareholder, he or she takes all ten, but if the company has two shareholders, with a share each, then, in this game, they each receive five dollars. Many might argue that Chicago Express is the better game of the two, but few would do so for reasons of its marginally greater concordance with reality. Its fans celebrate the game for the fact ‘it packs an awful lot of agonizing decisions into the space of about an hour‘ and for the fascination of its ‘shifting alliances.’ Meanwhile, German Railways is praised by its fans for almost entirely the same qualities: for its ‘fascinating dynamically shifting relationships among players‘ and the way that ‘the game state changes quickly and dramatically’ (same page of comments as the previous quote). Realism is pretty much a non-issue in both cases: In these instances, and others, I do not believe that players looking to privilege a form of mechanical accuracy, however that idea might be understood. Evidently, an implicit aspect of having board games as a hobby, rather than a single game, is the desire to work with different systems, and presumably to gain emotional or intellectual enrichment from drawing connections between those systems. 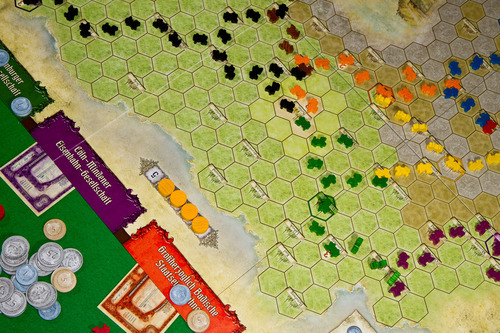 The urge behind exploring new games is seldom, I believe, to find a single most utile system: an 18xx fan, for instance, does not generally approach the system trying to find the one 18xx game which will most help him or her in life and in business. He or she is, I believe, looking for stimulation, rather than practical advice, and, as such admits variety as means of greater stimulation. Pieces of advice can mostly only be followed individually; though all of my friends may give good advice for a given situation, some inevitably has to be followed to the exclusion of others – a composite, generated from part of one suggestion and part of another still only constitutes a single plan. Stimulation can, by contrast, coexist from multiple sources: consider the effect on the brain of a day playing different games, against a session in which only one game is included. In not seeking authority, conflicting ideas can be left to play with one another. I believe that is a key aspect of my own relationship with strategy games, and I do not believe I am alone in this. There is a contrast with those game cultures which do often involve exclusive, or near exclusive engagement. For instance, there are, it is interesting to note, any number of books which purport to apply chess theory to other contexts, particularly to business. To a certain extent, it is beside the point whether these books do actually draw upon the mechanisms of chess as analogues for aspects of business, or whether they instead promote as useful more generic personal characteristics which might be found in a good chess player, such as focus and patience. The point is that, with a single source, there is the expectation that utilizable advice can be sought. Chess players may celebrate the novelty the game can produce, even after numberless plays, but it is clear that novel stimulation cannot be the primary driver for returning to the same game repeatedly. From the perspective of stimulation, there may even be an inverse relationship to a game’s accuracy as simulation. If a game coheres with the world, it may be more approachable, and its stimuli more readily digested (each of which is important in creating a pleasurable, valuable game experience) – but I believe this can often be at the expense of a depth of stimulation. The curious dividend mechanism of German Railways is, for me, more stimulating than the more conventional one found in Chicago Express: through its idiosyncrasy, the German Railways system occasions more distinct game states, more removed from other gaming experiences. The game does not give me much which can directly be processed as advice, but gives me a wealth of more abstracted, less structured stimulation. It makes me think differently, which in itself is to be lauded. In board and card games, I would contend that false economies are not only to be accepted, but celebrated.